Unlike most pastellists, I like working on a white surface. Since I used to work in watercolor, I find a white surface a wonderful way to push the pastels to be the brightest version of itself. 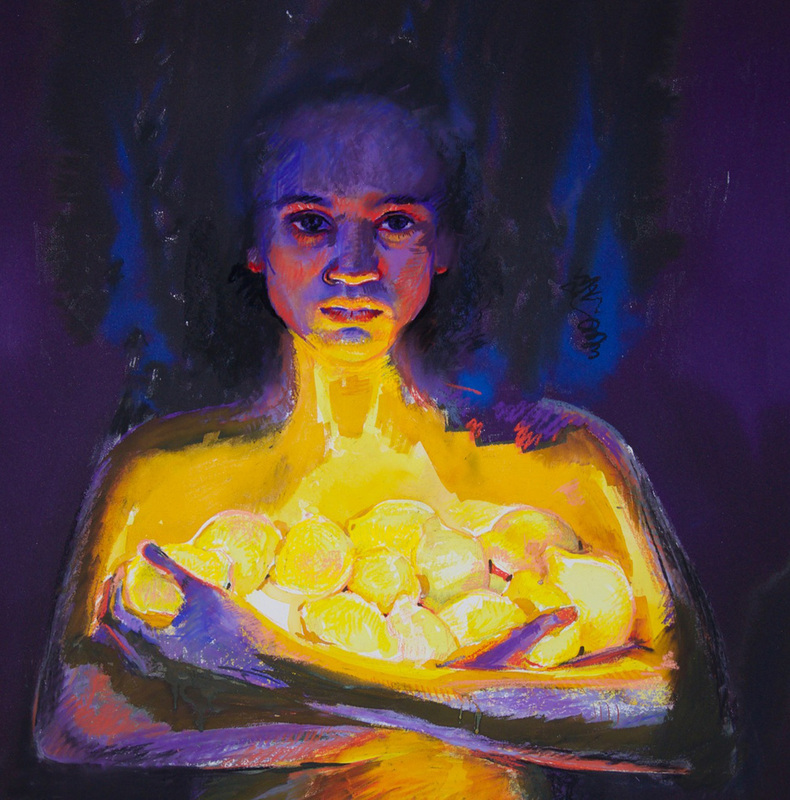 Working on a toned or darker surface can mess with the purity of the colors and getting the lemons to glow was key. 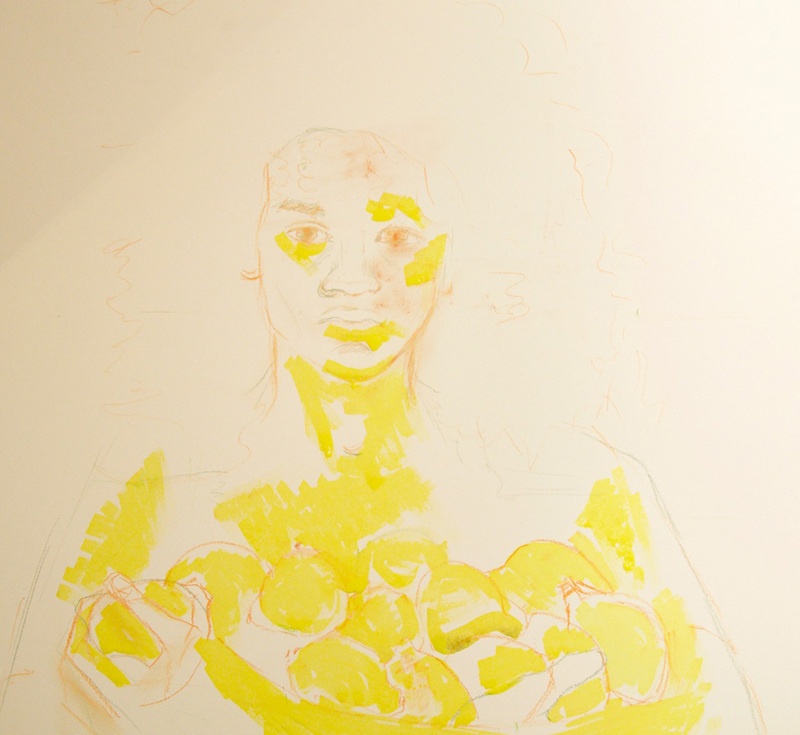 I was never going to get a clearer, brighter “yellow” than on a white surface, so I started off with a loose drawing and washed in bright yellow with pastel and water in areas that would have the most light on the surface. My paintings tend to wind up pretty tight, but I always start off pretty loose. Then the colors get “pushed” or exaggerated… I don’t think in terms of “correct” color at all at this point. I knew I wanted a color harmony of 4 colors- violet, yellow, red-orange and blue-green. So here I am playing with those 4 colors. Seemingly crazy marks and wilder textures will help the overall finish. I kept thinking about the arms and the space they took up- the structure. She looks like she needs a few cups of coffee….. 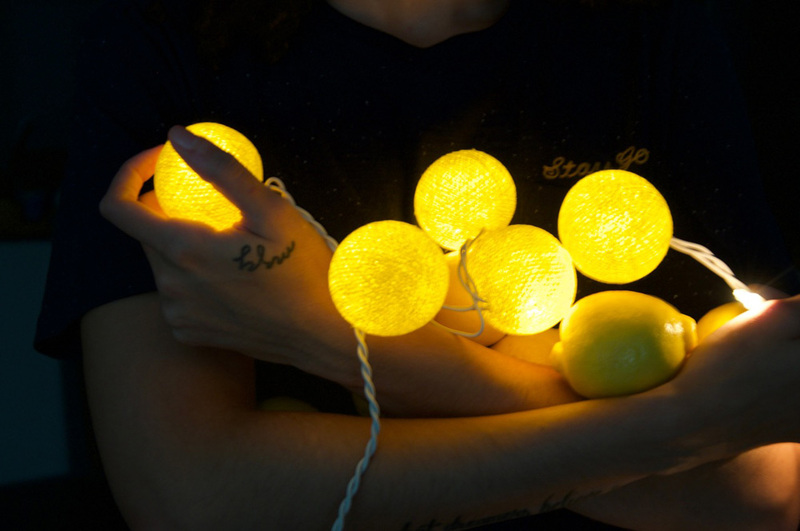 I had found this string of lights online that I thought could help since it had yellow balls on them and since I had wanted the lemons to be lit from within. Not an easy task since I couldn’t actually make lemons do that. I even tried cutting peels off lemons and then putting those in bright sunlight and studying how the light came through the peels. Nope, no good. A lemon peel is pretty opaque. 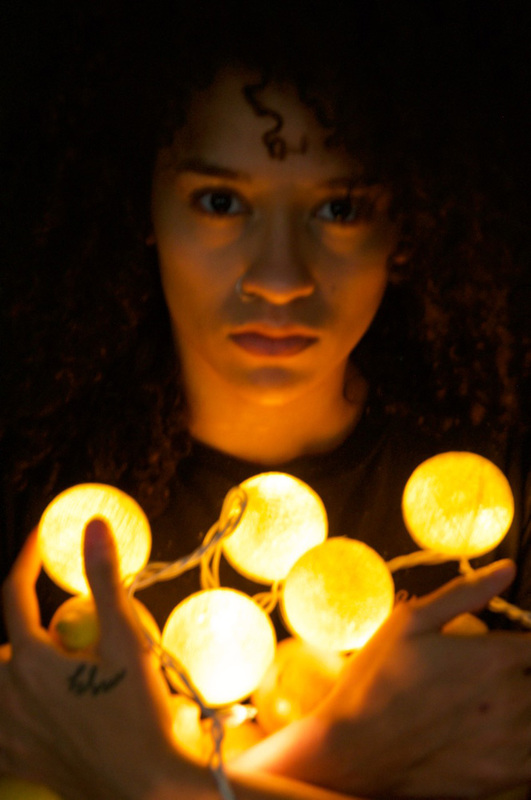 Working with my model, I tried to get the feeling of lemons lit from within from the lights. 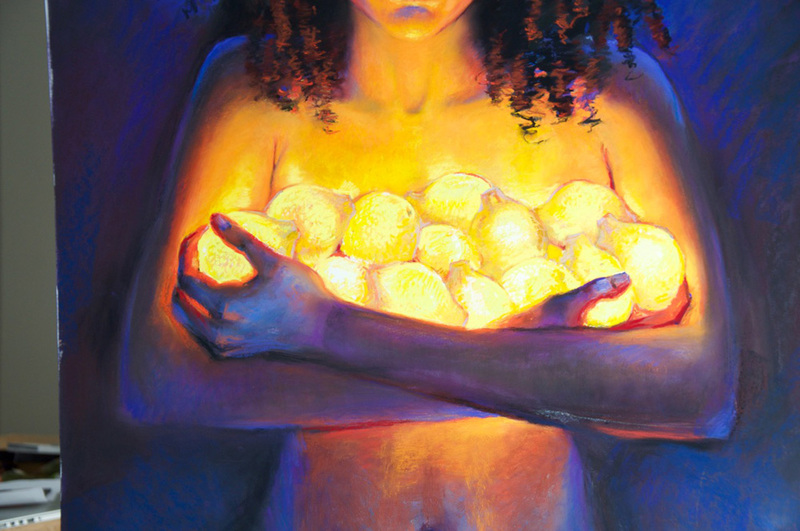 My lights were round, but I tried to get “lemon shapes” to them. I had many photos trying to get the upward lighting I was after on her face. The light set was pretty weak so it didn’t throw off much light, so I also used a flood light as well to get more light on her face or shot very dark, blurry photos to see how the light bounced up on her. Your process is so very interesting, thank you for sharing! you bet! We have to help each other out in the trenches! Loving this blog – so helpful to see the stages of your painting and know that sometimes a wonderful painting is a struggle! oh man- they are all a struggle right? Please tell me it is not just me….. I so appreciate you sharing your technique. Thanks!! I really like seeing your process with the description and results. You put so much thought in the how tos and precision in the executions, No wonder you have so much life in your finished pieces. Thank you. thanks so much. yes, painting is very mental for me…. This is a wonderful painting! Thank you for sharing the steps and your process!